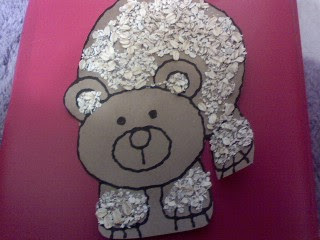 So... one bear was covered in glue and he put oatmeal on it. It's cute! 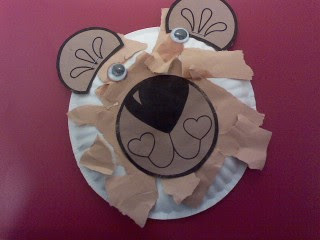 The other bear is a small paper plate with ripped construction paper and all glued on. It looks like he did a good job there. This is such an improvement from just six months ago! I think they are adorable. My son doesn't like doing arts and crafts projects. When he does do one, I save it forever.